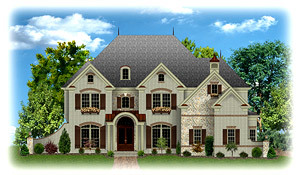 Homes of Atlanta will not leave it up to your imagination to view your new home design in its completed state. We provide professional rendering services so that you can see what your future dream home will look like on the property you have selected. These renderings can be in color or black and white. We can also include the proper slope of your property, specific trees and landscaping details and any other specifics you would like to view. Now you can have a very good idea of how your new home design will appear within the setting of your choice. Our Rendering Services begin at $500.